Thyroid issues have been becoming increasingly common in recent years, prompting many questions surrounding thyroid health. What is the thyroid? What does it do? Where is it located? What is the difference between hyperthyroidism and hypothyroidism? Hopefully this article can help answer these questions for you so you can ensure your thyroid stays healthy or, if there are already issues, that it gets better. The thyroid is a gland that secretes hormones that regulate many metabolic processes, including growth and energy expenditure. If the thyroid becomes overactive or slow it will affect the metabolism accordingly, which can lead to a variety of symptoms that are often misdiagnosed. Thyroid issues are fairly common, with at least one in 20 people affected in their lifetime, and women more susceptible than men. 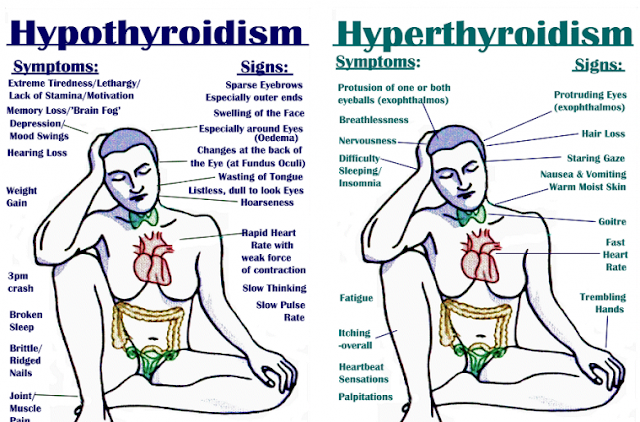 What Is The Difference Between Hypothyroidism And Hyperthyroidism? The most notable difference between the two dysfunctions is the hormone output from the thyroid. Hypothyroidism means your thyroid gland is not producing enough of the thyroid hormone for the body’s needs, while hyperthyroidism means it is producing too much. The symptoms of each of these conditions can vary greatly because hormones affect so many aspects of how our bodies work. With hypothyroidism, you generally feel sluggish, have trouble concentrating, have dry skin and hair, experience muscle pains and cramping, are prone to fluid retention, and feel sensitive to cold. With hyperthyroidism, unexplained weight loss is common, as are accelerated heart rate, trouble sleeping, irritability, anxiousness, and sensitivity to heat. Some people even develop a lump on their throats, which is called a goiter. This can signify that your thyroid is working too hard or that you have a severe iodine deficiency. The most common causes for thyroid conditions are: chronic stress, toxicity buildup, iodine deficiency, accumulation of heavy metals, and various autoimmune conditions. Hyperthyroidism can be caused by conditions like Grave’s disease, which increase thyroid hormone production. Subacute thyroiditis and toxic adenomas are also conditions that lead to this. Hypothyroidism is generally triggered by conditions that reduce the production of thyroid hormone, like Hashimoto’s thyroiditis. The removal of the thyroid or an excessive exposure to iodide or lithium can also cause it. How Can You Prevent Thyroid Conditions? The key to preventing thyroid conditions is living a healthy lifestyle that supports a healthy thyroid and a healthy metabolism. If you have already been diagnosed with a thyroid condition, then you may need to give some extra care and pay more attention to your diet and lifestyle. As suggested by Dr. Hyman, below is a 7-step plan to boost your thyroid and metabolism. Identify and treat the underlying causes of hypothyroidism, which include: food allergies, heavy metals, various nutritional deficiencies (like iodine), and most commonly, stress. If certain foods cause you digestive stress, like gluten and/or dairy, eliminate them from your diet. You can support proper thyroid function by optimizing your nutrition. Include foods that contain iodine, zinc, omega 3 fats, and selenium, among other essential minerals and vitamins. Try to completely eliminate any refined flours, sugars, and basically all processed foods, as these are generally loaded with sugars and other unhealthy ingredients. Be sure to take time to meditate, exercise, practice breathing techniques, and spend time outdoors — all of the above have been shown to significantly reduce stress. If you are really stressed out, make sure to use these techniques regularly. Practice specific thyroid stimulating exercises, which can boost thyroid function. Working up a sweat can also help you to safely remove toxins from your body. You can use various supplements that help enhance thyroid function, including all the nutrients that are essential for proper thyroid and metabolism function. You may wish to speak to a holistic doctor or naturopath to find out exactly what’s right for you. Consider using saunas and heat to eliminate toxins stored within the body. Depending on the severity of your condition, you may need to start hormone replacement therapy. This can help to support your thyroid gland. Your doctor should be able to tell you exactly what will work best for you. Remember, your body is a wondrous machine and its ability to heal itself is even greater than you can imagine. Trust that if you are following the necessary steps to get better, everything will work out. It just takes a bit of discipline, patience, and self-care — all things that most of us could use more of anyways.